How can programmes promote quality childcare at scale? In Latin America, we have seen a rapid expansion of publicly funded childcare services for children younger than 3 years of age. While maternal employment can enhance families’ incomes, and this will favour children’s well-being, this new reality of early childhood care raises important policy questions. In countries like Brazil, Chile, Colombia, Ecuador, and Uruguay, at least 40% of children are using childcare services by the time they are 3 years old. In some of these countries, 2 year olds are also using these services with similar frequencies. An increased demand for childcare services responds, in part, to the changing demographics of Latin American families, characterised by a rise in urbanisation, fewer extended families, and an increase in women’s participation in labour markets. Between 1999 and 2014, female labour force participation rose from 58% to 65% in Latin America (Duryea and Robles, 2016). This change can be seen across all education groups, and also among women with children younger than 5 years of age (Berlinski and Schady, 2015). There is an ample literature on what are the key elements of good-quality childcare. The experts usually distinguish between structural elements of quality and process quality. Structural quality relates to the infrastructure, the availability of materials, the qualification of the personnel in charge of children, and the caregiver-to-child ratios. Process quality focuses on the nature of interactions between caregivers and children. For young children, high-quality interactions need to be frequent, responsive to their interests, rich in language, warm, and sensitive to their needs. Structural quality is important to ensure adequate conditions of safety and hygiene. Moreover, structural and process quality are interrelated: for example, in a setting with few caregivers per child, it becomes more difficult to provide frequent, individualised interactions. Research suggests that process quality is crucial for childcare services to attain child development outcomes that can be sustained over time. In other words, process quality is something that should not be compromised on. The evidence available in Latin America is not encouraging, as it suggests extremely low levels of process quality (Berlinski and Schady, 2015). In a recent paper, my colleagues and I explored the relationship between process quality and child development outcomes (Araujo et al., 2017). 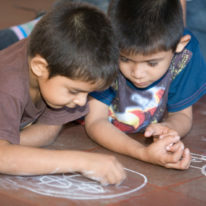 We looked at data from the largest provider of publicly funded childcare services in urban Peru, the Cuna Más programme. Process quality was measured at the classroom level. We had information on the quality of two classrooms in each of the 291 centres studied. We administered the Toddler Classroom Assessment Scoring System (CLASS) (La Paro et al., 2012), a well-known instrument that has been used in Latin America to measure process quality in the classroom. The focus of the CLASS is adult–child interactions. In addition, we visited the children from these classrooms in their homes, where we administered the problem solving, fine motor, and communication scales of the Ages and Stages Questionnaire, third edition (ASQ-3) (Squires et al., 2009), a screener assessment that has been used in the region in several at-scale studies. We compared process quality and child development outcomes across classrooms within childcare centres. We found that a child exposed to a classroom with a caregiver who offered one standard deviation higher process quality had development outcomes that were 7% of a standard deviation larger in magnitude. We also found that caregivers with more years of education were not more effective at producing better child development outcomes, but that caregivers with more years of experience were. Do not rush expansions in coverage without a strategy to provide quality services in place. In many countries of Latin America, the coverage of education services was expanded rapidly without a focus on the quality of these services. This is not a good idea for childcare. The evidence suggests that low-quality childcare services for children younger than 3 are not innocuous. They can in fact have negative impacts on child development (Berlinski and Schady, 2015). Therefore, expansion in coverage should be planned side by side with efforts aimed at quality improvement and consolidation. Target well. A key takeaway from studies of high-quality childcare services with long-term impacts on education and employment is that these services were designed for children from very poor, vulnerable families. 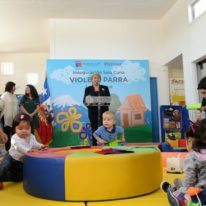 While Latin America has developed sophisticated targeting systems for some of its social programmes, these are not always used for publicly subsidised childcare. It is children from the most disadvantaged families who are also the most likely to experience low-quality home environments, poor in stimulation and learning opportunities. It is precisely this group of children who would benefit the most from quality childcare services. Work conditions. The staff of childcare centres often work in suboptimal conditions. Many programmes do not hold a formal employment relationship with their staff, they do not pay a salary or provide other worker benefits. A sizeable portion of the workforce volunteers their time. Under these conditions, quality and accountability are not possible. Experienced and effective caregivers have every incentive to leave the sector and find better jobs with private sector providers. Mentoring. Offering care that is characterised by frequent and consistent high-quality adult–child interactions is something that can be learned. Mentoring schemes have been put in place to work individually with caregivers in building these competences. They require qualified mentors, who can engage the caregivers and gain their trust. 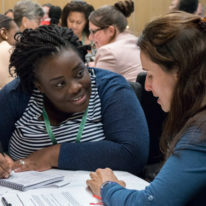 Mentoring should be at the heart of in-service training strategies of childcare service providers. More research is needed on what are the most effective mechanisms to provide mentoring at scale. Continuous quality improvement. Social programmes are making use of technology to simplify many operational processes. Continuous quality improvement relies on real-time data that that can trigger consequential actions. Four key elements should be in place for a quality improvement system to work: the definition of specific results to be achieved; agreement on how they will be measured; identification of changes that are required to achieve those results; and a cycle of innovation and continuous learning that adjusts dynamically. Pre-service training. 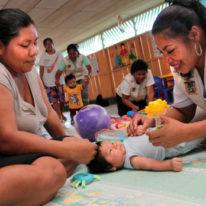 Latin America is not producing enough early childhood professionals to meet the expanding demands of this sector. There might also be the need to align the skills offered by higher education training programmes with the best practices in the field. High-quality services at scale require an organic coordination with the higher education services in charge of training the workforce of the future. Curricula and early learning guidelines. Curricula play an instrumental role in achieving process quality. They reflect an agreement around results. They also align the efforts in the areas of training, monitoring and evaluation that are necessary to achieve those results. 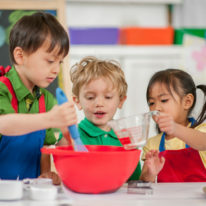 Curricula help the daily work of caregivers, particularly in low-capacity settings, where they provide structured activities and materials for the children under their care that are age-appropriate and can foster opportunities to learn and explore. "Process quality is crucial for childcare services to attain child development outcomes that can be sustained over time. In other words, process quality is something that should not be compromised on."